When Nick and Amy Fulton talk about their 2-year-old son Fisher, you hear nothing but love and adoration in their voices. “He’s all boy. He loves tractors, wrestling, and football and is always on the go,” laughs Nick. So, when their normally rambunctious toddler woke up one day feeling wiped out from an increasingly bad stomachache, Nick and Amy were concerned. There, the staff ran a battery of tests, but nothing came up conclusive. As the day wore on, Fisher continued to grow more withdrawn because of the pain. Finally, without any answers, the clinic directed Nick and Fisher over to the hospital for a CT scan. That’s when they found the cause of Fisher’s pain; he had acute appendicitis, and as a complication of that, his appendix had perforated. He wasn’t himself. We thought it was just a bellyache but it kept getting worse." This news meant they had limited time. Fisher needed emergency surgery and his doctor had to act fast. Unfortunately, there were several hurdles in the way of getting Fisher into the operating room, the first being that the hospital’s surgeon wasn’t on duty, and neither was the surgeon at the hospital in the neighboring town. With their panic growing, the Fulton’s turned to their doctor for options. Their next option was to have Fisher transported to Billings by ambulance, but the hospital didn’t have a transport nurse available to administer needed antibiotics during the drive. With their options running out, Amy remembered that just a few months back she had purchased an air ambulance membership through the AirMedCare Network shortly after they found out they were expecting their second child. If a helicopter was available, Fisher could be flown to Billings at no cost. With this news, everyone sprang into action. 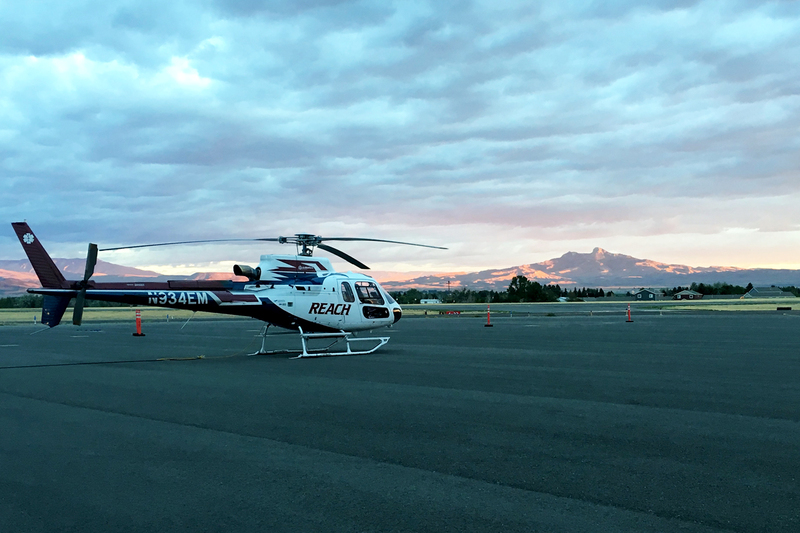 The hospital quickly called REACH Air Medical Services’ 24-hour communications center to request a transport from REACH 28, their base in Cody, Wyoming. When the hospital got confirmation that REACH had accepted the transport, the doctor informed Amy that she wouldn’t make a good candidate to fly with Fisher because she was 25 weeks pregnant. Not wanting to miss her son’s surgery, Amy decided she and her parents would make the drive to Billings. However, if she were going to make it in time, she had to leave right away. The REACH 28 AS350 helicopter out on the tarmac in Cody, Wyoming. After saying their goodbyes, Nick and Fisher were left to anxiously await the arrival of the helicopter. Within minutes, Pilot Kenneth Campbell, Flight Nurse Jacque Palazzolo, and Flight Paramedic Jessica Freire were touching down on the hospital’s helipad in an AS350 helicopter. Once in the ER, Jessica and Jacque got right to work greeting both Nick and Fisher and explaining exactly what was going to happen from the minute they lifted from the helipad in Powell to the second they touched down in Billings. As they got into the details, Nick was faced with yet another bit of challenging news – there wasn’t enough room in the aircraft for him to fly along with his son. Despite having to travel by himself, Fisher was going to be in the very best care. Combined, Jessica and Jacque have 23 years of clinical experience and are used to being around children. Jacque has three children, one of whom is close in age to Fisher, and Jessica has become a regularly requested favorite at school demonstrations because of her ability to get on a child’s level. Neither of these things were lost on Nick. They went above and beyond; they were grade-A, as good of a medical staff as I’ve ever been around." As the pair began preparing Fisher for transport, they tried to set him at ease using a simple technique – honesty. Before they wheeled Fisher out to the aircraft, Jessica and Jacque took down Nick’s cell phone number and promised him that he would receive regular updates from them. Then they invited him to follow them out to the helipad so he could give Fisher a hug and a kiss before they departed. “When we took Fisher out to the aircraft, I told his dad that because Fisher was going to be bundled up and warm, he’d be asleep before we even left Powell,” said Jessica. Jessica’s prediction was correct. Before they even hit their cruising altitude, Fisher was fast sleep. While they closely monitored his condition, Jessica and Jacque also took the time to send updates and photos to Nick to help put him at ease. Meanwhile, on the drive to Billings, Amy was able to spot the aircraft from the car. The flight was smooth and relatively quick, lasting about 40 minutes. As Ken was safely landing the aircraft at the hospital in Billings, Amy was just blocks away. 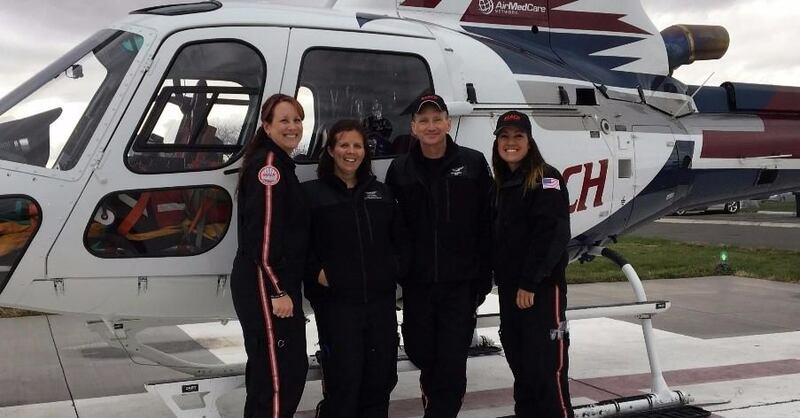 From left to right: REACH Air Medical Services' flight team: Jacque Palazzolo, Flight Paramedic Jessica Freire, Pilot Kenneth Campbell, Flight Nurse Rachel Severinsen. After unloading Fisher from the helicopter, Jessica and Jacque took him into the Emergency Room where the staff prepared him for surgery. That night, Fisher underwent an emergency appendectomy, and we are happy to report that everything went smoothly. Just two days later, he was released to go home. While the whole experience is one that no parent would ever want to go through, the Fulton’s did walk away feeling grateful for their son’s swift recovery and for the crew of REACH 28 who cared for him. And, as for the cost of Fisher’s flight, it was completely covered by the family’s AirMedCare Network membership.